"The Lafferty Chronicles: An American Dream"
Starting from nothing to creating engines, a motorsports team, and a Driver Development Program just by having a dream and chasing it? Chris Lafferty did it and now you can watch the ups, downs, ins, outs and everything in between in the process of making it big! At what lengths are you willing to chase your dreams? 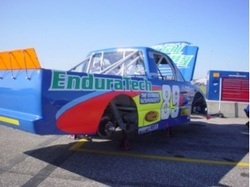 How did a kid living in a Ryder truck in a Lowes Home Improvement parking lot turn out to be possibly the next big name in NASCAR along the likes of Rick Hendrick, Jack Roush, Richard Childress and all other renown NASCAR team owners? 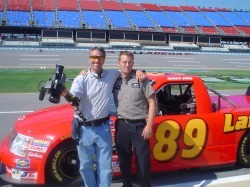 Ride along as Chris Lafferty builds his struggling racing empire in the NASCAR Camping World Truck series into one of the biggest teams in NASCAR, or will he “crash and burn” in this emotionally charged reality television series? 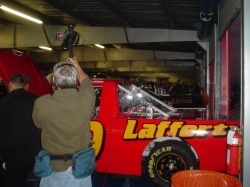 Lafferty offers a real, behind-the-scenes, look at the battles fought every day when you’re a part of one of the most cut throat businesses out there! Sit in on team meetings where feelings are pushed to the limits; Sportsmanship, Driving Ability, Leadership, Public Relations, Savvy and Ruthlessness take their toll. Watch the personality conflicts, the impact on the teams racing ability, and the decisions that could make or break the team. While the big guys are trying to decide which plane to take to the race, this team is trying to figure out which decisions will help pay the bills and take us to the next race. See how their lives outside of racing impact the team. Could an argument at home last night lead to an oversight on the race track? This is an in-depth look at what goes into the decision making around here. Watch and see if we made the right decisions. “At 200 miles per hour, even the smallest error could kill someone”, exclaims Chris. How do wives, girlfriends, husbands, boyfriends and children affect their performance? How do they feel about being on the back burner while the team is spending long nights trying to make the next race? 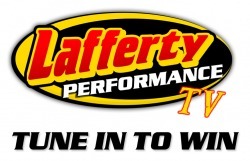 No soap opera has the real day-to-day drama like a day at Lafferty Motorsports! Lafferty’s ability to provide the audience with beneficial knowledge in such an attention grabbing manner is incomparable. Watch the rewards that come with winning, and the gut wrenching disappointments with defeat in these action packed episodes! Interested in becoming a partner of the show? We are currently looking for partners to advertise on our show. We encourage all companies to contact us for more information as to how you can join us in this adventure and take your business to the next level with high exposure at low costs. Call our Marketing Team today at (704) 795-5375 and get ready for the ride of your life! Click here to contact our Marketing Team!